To those from the land Down Under, the bush telegraph was a way for remote communities to keep in touch; for fans of I’m a Celebrity, Get Me Out of Here, it’s the room where contestants can post their many and varied thoughts on slumming it in the jungle and chowing down on some more ‘delectable’ bush tucker. 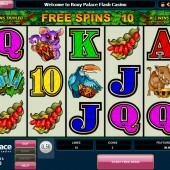 However, to slots fans, it should become the byword for fast and fun video slots. Online slot developer Microgaming’s outback-themed game joins the plethora of slots that have hooked fans of the great outdoors over the years. Think Microgaming’s jungle-themed slot, Mega Moolah, or even Rival Gaming’s Crocodile Dundee-themed venture, Diamonds Down Under, and you’ll know where you are with Bush Telegraph. 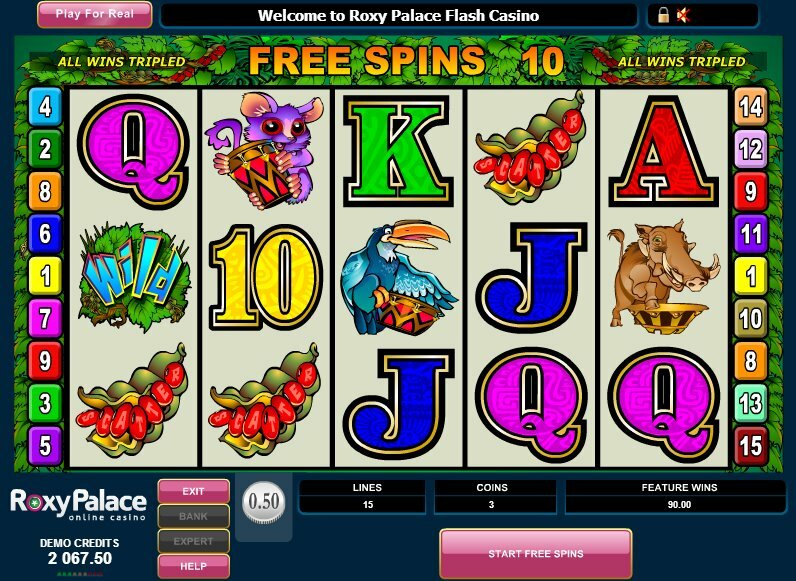 Bright colours and cartoon graphics set the tone here in this 5 reel, 15 pay-line slot. Warthogs, toucans, bongo drums and bush babies, as well as the usual 10-through-Ace symbols fill the reels, and there’s some cute animation thrown whenever the Wild symbol comes into play. Speaking of which, the Wild symbol acts as the Wild. It substitutes for every symbol other than the scatter and the Bongo Bonus symbol. Bag five Wilds and you’ll take down the jackpot of 7,500 coins. The seedpod symbol acts as the scatter, and 3, 4, or 5 of these anywhere on the reels will win you free spins. Spins can be multiplied. And what’s the Bongo Bonus, I hear you ask? Well, get three or more of these symbols anywhere and you’ll activate the titular bonus game, whereby you’ll be faced with 11 bongos on-screen. Choose the bongos that contain bonus coins and keep going till you cash out. With a huge range of betting (betting starts at $0.01, but high rollers can bet up to $75), simple but colorful graphics, and a theme that’s been a success for other similar slots, Bush Telegraph is one game that you should be writing home about.